Juvederm®/Restylane® are versatile dermal fillers that can address a number of facial signs of aging and produce beautiful, long-lasting results. They can smooth away wrinkles, folds, furrows and fine lines and even plump your lips. With no pain or downtime, you can undergo treatment on your lunch break and get back to life with a fresh, rejuvenated appearance. To learn more about fillers treatment, please contact Synergy Medical Aesthetics today online or at 250-591-1566 to schedule a personal consultation and assessment with experienced dermatologist Dr. Gabriele Weichert or board-certified plastic surgeon Dr. Philip Barnsley. We help patients from Nanaimo and across Central Vancouver Island achieve their aesthetic goals. What Is Juvederm® and Restylane®? These are smooth gel fillers that significantly diminishes the appearance of facial wrinkles and lines. Unlike the popular nerve-inhibitor BOTOX®, fillers contain hyaluronic acid (HA), a substance that occurs naturally in the body to help your skin look firm and youthful. As you get older, your skin’s natural HA levels begin to subside, causing a loss of volume and structure that can result in deep lines and wrinkles around your nose and mouth. The unique formula in these fillers looks and feels very soft and natural. Both Juvederm® and Restylane® treatment is reversible in the event of overcorrection or minor complications. This versatility provides Dr. Weichert and Dr Barnsley with greater control over your final results and minimizes the risk of complications. 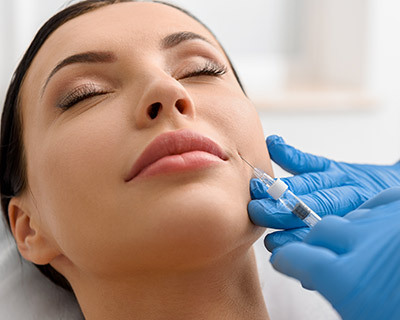 During your non-surgical treatment session, the appropriate filler product will be injected into the targeted treatment areas by experienced dermatologist Dr. Weichert or board-certified plastic surgeon Dr. Barnsley. With years of extensive training and clinical experience, our physicians understand the musculature and contours of the face and knows precisely how to soften lines and hollows. The procedure itself is fast, easy and virtually painless. You may experience slight pressure or mild discomfort, but these sensations will quickly subside. Your results should be immediately visible and they will continue to develop over the next few days. For most patients, results last between six and nine months, at which point a follow-up treatment is necessary to refresh your results. At Synergy Medical Aesthetics, the cost of each syringe of of filler ranges between $600 and $725. While treatment varies from patient to patient, a typical treatment session usually involves one to two syringes. 1-2 syringes are needed for most corrections, but volume restoration may require multiple syringes in some patients. Your customized treatment plan will be discussed by our trained physicians. If you are considering filler injections in Nanaimo or nearby area in Central Vancouver Island, please contact Synergy Medical Aesthetics today by completing the form on this page or calling 250-591-1566 to schedule a consultation with our highly-trained and friendly Dermatologist Dr. Gabriele Weichert or board-certified Plastic Surgeon Dr. Philip Barnsley.